Sometime in the 1970s I transcribed a taped interview in which Daphne Marlatt spoke about writing, poetry, and language, perhaps the first of her “Vancouver” poems. It may have been part of a project George Bowering had initiated and I believe the interview was part of a longer series. In those days at Simon Fraser University‘s English department, faculty would just assume a graduate student would do specific tasks for them. It was part of your education. Even as an undergraduate I wrote a bibliography on Ezra Pound’s music reviews; transcribed audiotapes of Charles Olson lecturing; transcribed a Jack Spicer notebook into typescript. Whoever else this particular project of George’s may have involved, it was the interview with Daphne that I remember best. I would be set up in one of the department offices with a Dictaphone machine and a typewriter. You pressed the machines pedal with your foot and typed along with the voice and the headset. To rewind, you pressed another panel; likewise to fast-forward. Buy these means, Daphne’s sentences would appear in typescript through my ears and hands and feet, and annunciation-like situation, intimate and magical, for who is who in such a situation. The transcriber is an instrument, not an intermediary. And now a number of things have just occurred to me. One is how much transcribing I’ve done, not only a voices of cadences and syntax is like Daphne‘s, but also of the voices, cadences and syntaxes of various bosses at many secretarial jobs I had taken then, in the late ‘60s and into the ‘70s, when operating the Dictaphone also involved knowing how to fix sentences, even nuance, in one of the many letters informing someone that their insurance claim was being denied, or that they owed a certain amount of money, or that their desire for a pay raise was unwarranted. Also occurring to me just now is that my father had been a Morse code operator for the Navy, a “telegrapher,” as it says on his headstone, during the war years and for some years afterward. In the war years he had been stationed in Masset, BC, on what was then known as the Queen Charlotte Islands, to intercept Japanese code and send the decoded information to other telegraphers as far south as San Diego. After the war, he continued to work as a telegrapher—but also a photographer, an office typist, a door-to-door salesman for encyclopedias and vacuum cleaners, but it was these venture of telegraph he does he enjoyed most. You never knew what was going to come across the wires. The worst experience was when he found himself tapping out the telegram that was informing his father that his mother had just died in the hospital, following a vascular surgery. Later, he had a fascination with the potential of reel to reel tape recorders he would tape himself and various friends playing a piece of music like “Bye Bye Blackbird” and splice the results into impressive-sounding versions. He taped me speaking into the small baby grid of the microphone and played it back (“That’s me?” “That’s you!”); and he taped his own forts over a number of months, displacing them into one of Prime Minister Trudeau’s speeches. Dad would also fooled around with multiple tracks, displacing ukulele chords into tunes like “It’s Crying Time Again” to express how he felt leaving the Maui Sands motel after a two-week vacation. In another life he might’ve continued working with sound technology and composition, or record production, instead of having to get up at 5:00 a.m. to fill furnace oil tanks on 40-below Prince George winter mornings. He loved to imitate ethnic “accents” when telling jokes specializing in Jewish accents gleaned from TV comedians. When I think of it now, my particular “research assistant” skills were not without genetic nudging, nor the many projects since then I have involved bringing speech to print. Channeling Daphne in the early ‘70s was part of my education as a poet. The earlier part was my father’s lifelong fascination with the voice and rhythm. 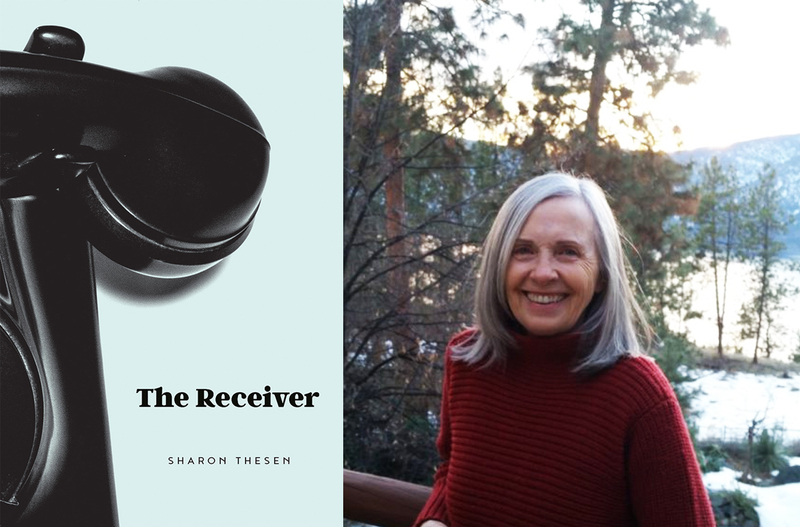 Sharon Thesen, from The Receiver, New Star 2017. Used with permission from the author. This poem was transcribed by reading it aloud into Dragon transcription software. It was then transferred via email to a word document, formatted, proofread, and finally posted here, for your pleasure.